A public forum in Bradford, got heated, to say the least. Parents of students at Oxbow High School asked some pretty tough questions to the administration. A former coach and teacher arrested for sexually assaulting a female student he coached from the 90’s. 43-year old Brian Musty was arrested last Wednesday. At times the meeting was tense as parents demanded answers as to why they weren’t notified of the arrest until days later. “They are minors do you forget that? We have a right to know what’s going on with our children,” said parent Bonnie Brill. 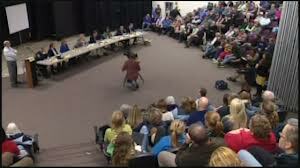 Wednesday night’s public meeting was to suppose to offer support for parents. Rather parents demanded answers as to why they weren’t notified of Musty’s arrest until days later. “They are kids, they are defenseless,” said parent Richard Wright. While the specific case wasn’t supposed to be mentioned, parents say they had concerns about the former coach for years. “I know I came in here as a part time coach for about a month and I told my daughters, ‘he’s inappropriate, you stay away from him,” said a concerned parent. “Why are we still letting him bring girls into his room? I don’t understand what more do we need to bring to you guys?” asked Wright. Including concerns over the schools closed door policy and why teachers are allowed to have blinds over their office. “I think a policy needs to be to take all these blinds and I’ll be the windows you don’t need that,” said a concerned teacher. The school has placed Musty on administrative leave.